I’ve been listening to Wolfmother lately since my friend Michael turned me on to them. Their debut record is an unabashed love affair with 70s hard rock from the likes of Black Sabbath, Led Zeppelin, and Deep Purple. And it’s really good. 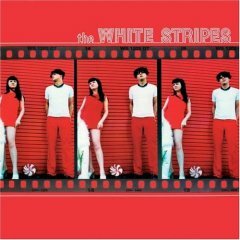 Which brings me to another debut record from a band that takes its inspiration from some of the same sources, that being the White Stripes. Their debut record came out in 1999, only seven years ago. But it seems like The White Stripes have been around forever. Their first record has plenty of Jack White’s signature guitar and wailing vocals. But it’s raw and full of the energy that debut records often have. And it has excellent covers of the Stones’ Stop Breaking Down and Dylan’s One More Cup of Coffee, and some old blues numbers including one by Robert Johnson. Jack White cracks me up. If he cracks you up too, I suggest you get the debut record and put it on loud.